Serendipity Garden Nursery - Our retail nursery and demonstration garden for Florida native plants and Florida-friendly garden techniques. See how best practices for sustainable gardening are being used in a large garden and carry away ideas for how you can implement them at your own home. Bee, Bird, and Bat Boxes - Any backyard habitat will want to offer nesting/sheltering spaces for wildlife. We build a variety of boxes for you to choose from when creating your own habitat for the wild neighbors. Rainwater Harvesting - This is an important component of a sustainable landscape. We sell re-purposed food grade barrels as rain barrels. We will also install in your garden previously purchased rain barrels or cisterns. 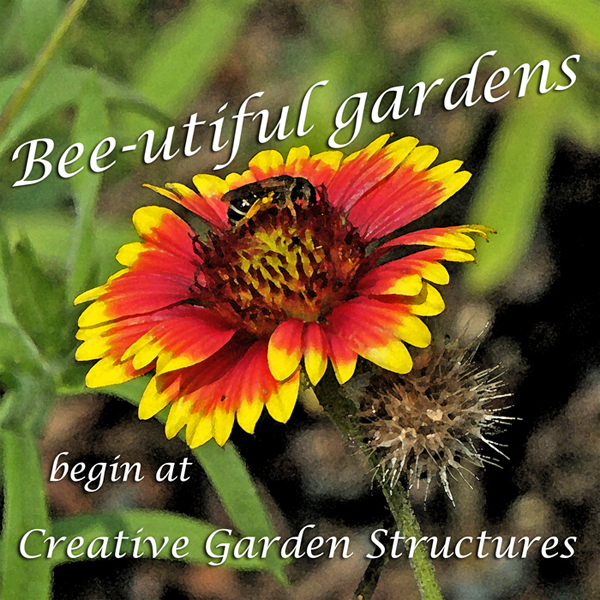 Custom Garden Structures and Furniture - A sustainable, backyard habitat should not only appeal to the local wildlife, but also the humans who work in or use the garden. Let us custom build that thing which will make your garden even more lovely to spend time in. Landscape Maintenance - Need help with maintenance in your own garden? In the Marion, Lake, and Sumter County area we will do that, too. We go beyond mowing your yard. We will weed, hoe, and trim. Our specialty is proper maintenance of native plant beds, trees, and shrubs. We will also work on your irrigation to set up zones in your garden based on plant requirements. However, we do not spray anything which is an herbicide or pesticide. These are not sustainable practices in our view. Contact Us - How to reach any of us. Explore more pages with the Menu at the top of this page.